One of Bugs Bunny's best known gags is to dress in drag and dupe whatever doofus happens to be giving him a hard time. And while Bugs Bunny merchandise isn't exactly slopping all over toy store shelves these days, you would think there'd be a few historical examples of Bugs Bunny in a dress that you could add to your waskally wabbit collection. 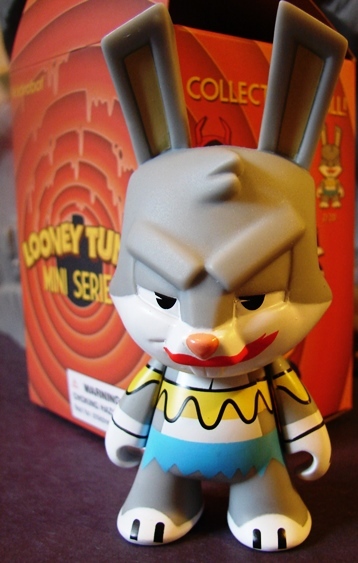 But to my admittedly limited knowledge, this Kidrobot vinyl Bugs Bunny is the only Bugs Bunny in drag ever made in toy form. 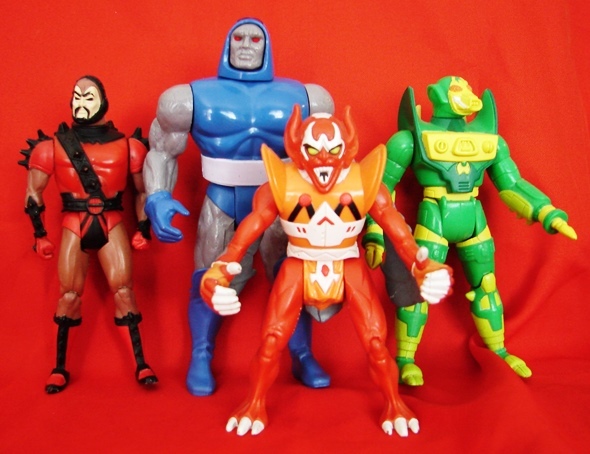 I'm sure there is a high-end statue of Bugs as Brunhilde, and perhaps there's a little hard rubber figurine or two from the eighties and nineties that I'm not aware of, possibly by Applause, that represents one of the moments Bugs threw on a skirt. Did Bugs wear a dress at any point in Space Jam? If he did, I suppose there might be something from that marketing jugger-'not'. But I doubt it. Anyways, it's a good schtick, and as iconic to Bugs Bunny as it is to Milton Berle. So when I discovered that Kidrobot was memorializing Bugs' gender-bent moment from the short Hillbilly Hare I just had to have him! Or her. Or whatever. I'm not judging. 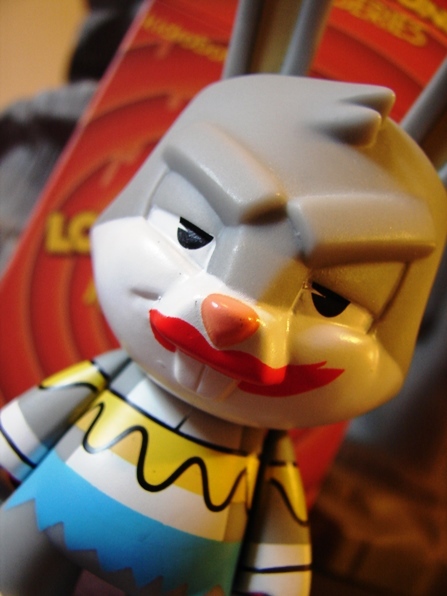 The figures from the Kidrobot Looney Tunes Mini Series are of course highly stylized, but there's no mistaking Bugs Bunny in the get-up he slapped on to mess with a couple of stupid Southern brothercousin rivals. 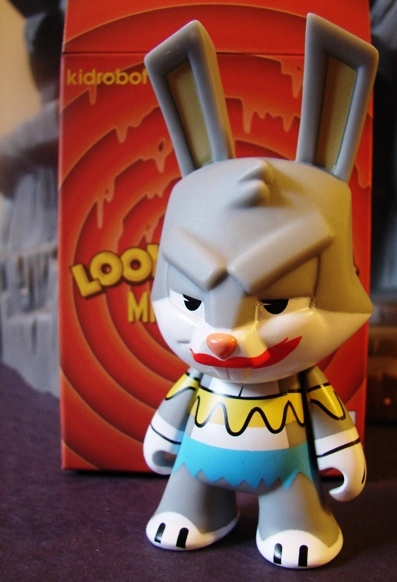 The Kidrobot Looney Tunes series is blind-boxed, which I hate, but fortunately Bugs-in-a-dress isn't particularly rare or sought after, so I was able to get him opened for retail price off eBay. If you know of any other examples of Bugs Bunny in drag merchandise, let me know about it in the comments! Kind of disturbing in a Health Ledger joker sort of way and totally works here...I like it. i have some Kid Robot vinyls I love!